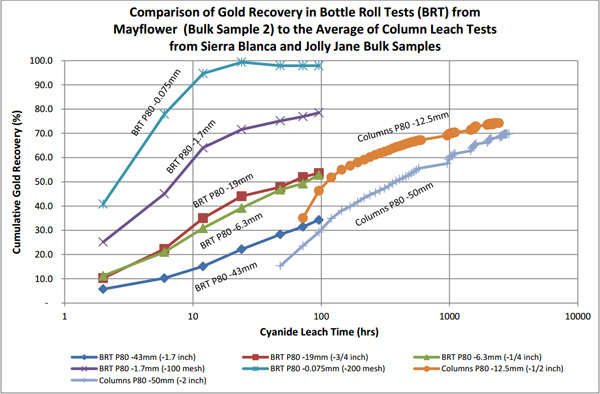 Vancouver, B.C……..Corvus Gold Inc. (“Corvus” or the “Company”) - (TSX: KOR, OTCQX: CORVF) is pleased to announce a series of bottle roll tests performed over 96 hours on bulk sample materials collected from historical mine waste dumps at the Mayflower deposit (see Figure 1). Test results confirm potential for low cost heap leach recovery operation. Samples returned approximately 98% of gold recovered for particles ≤ 200 mesh size (-0.075mm). The initial Mayflower results (Table 1) have returned similar or better leach curves to other oxide ores in the district. The Company is conducting similar leach tests on samples from the large diameter core drilling program that was completed in June to assess the long term recovery rates of different size fraction at Mayflower. Based on this initial data the Company expects the long-term Mayflower gold recovery rates to compare very favourably to those observed in the column tests run between 100 to 120 days from bulk samples at Sierra Blanca and Jolly Jane (Chart 1) as reported in the Preliminary Economic Assessment of North Bullfrog (Technical Report and Preliminary Economic Assessment for the North Bullfrog Project, Bullfrog Mining District, Nye County, Nevada, February 28, 2012). Metallurgical composites have been prepared from the PQ core drilled in Phase 1 of the 2012 program (NR12-16, June 12, 2012). A total of 6 composite samples have been created for the Mayflower deposit, with sufficient material for 12 individual column leach tests at a P80 size of -3/4 inch (-19 mm). The column leach results will be supplemented by bottle roll tests on each composite at nominal P80 sizes of -200 mesh (-0.075 mm), -100 mesh (-1.7 mm), -1/4 inch (-6.3 mm) and -3/4 inch (-19 mm). A similar group of columns and bottle roll tests have been prepared from composites of PQ core material from Sierra Blanca. Leaching of the columns has begun at McClelland Laboratories, with final results planned to be available in December 2012. Figure 1: Corvus land position at North Bullfrog showing the Mayflower Resource Area, and the Other Resource Areas. Drill collar locations are shown for reference. The project currently includes numerous prospective gold targets with four (Mayflower, Sierra Blanca, Jolly Jane and Connection) containing an NI 43-101 compliant estimated Indicated Resource of 15 Mt at an average grade of 0.37 g/t gold for 182,000 ounces of gold and an Inferred Resource of 156 Mt at 0.28 g/t gold for 1,410,000 ounces of gold (both at a 0.2 g/t cutoff), with appreciable silver credits. Mineralization occurs in two primary forms: (1) broad stratabound bulk-tonnage gold zones such as the Sierra Blanca and Jolly Jane systems; and (2) moderately thick zones of high-grade gold and silver mineralization hosted by structural zones with breccias and quartz-sulphide vein stockworks such as the Mayflower and Yellowjacket targets. The Company is actively pursuing both types of mineralization. Mr. William J. Pennstrom, Jr., a consulting process engineer and President of Pennstrom Consulting Inc. has acted as the Qualified Person, as defined by NI 43-101, for evaluation of the metallurgical testing data. He has over 30 years of experience in mineral process design and operation, and has been an independent process and metallurgical consultant for the mining industry for the last nine (10) years. He is a Registered Member of the Society of Mining, Metallurgy and Exploration (SME Member No. 2503900). Mr. Pennstrom and Pennstrom Consulting Inc. are both independent of the Company under NI 43-101 definitions.